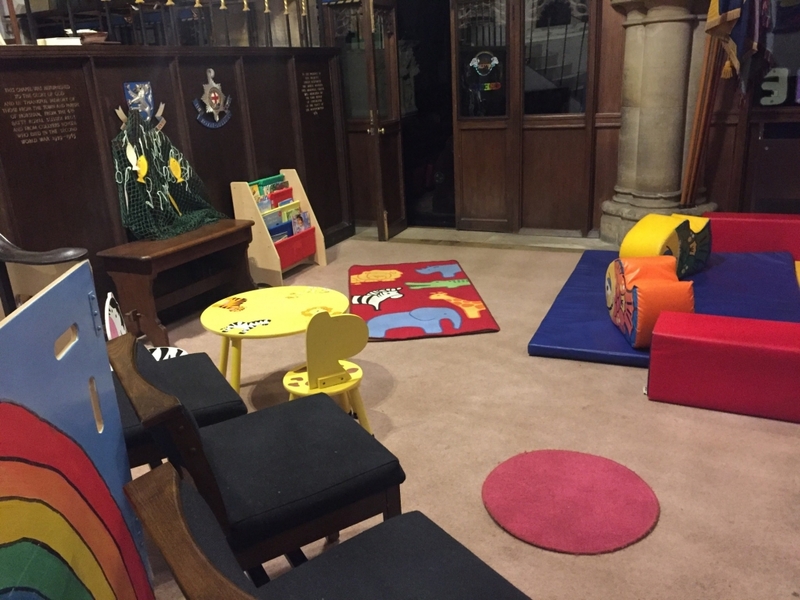 Our crèche is located in the Holy Trinity chapel next to the north aisle. 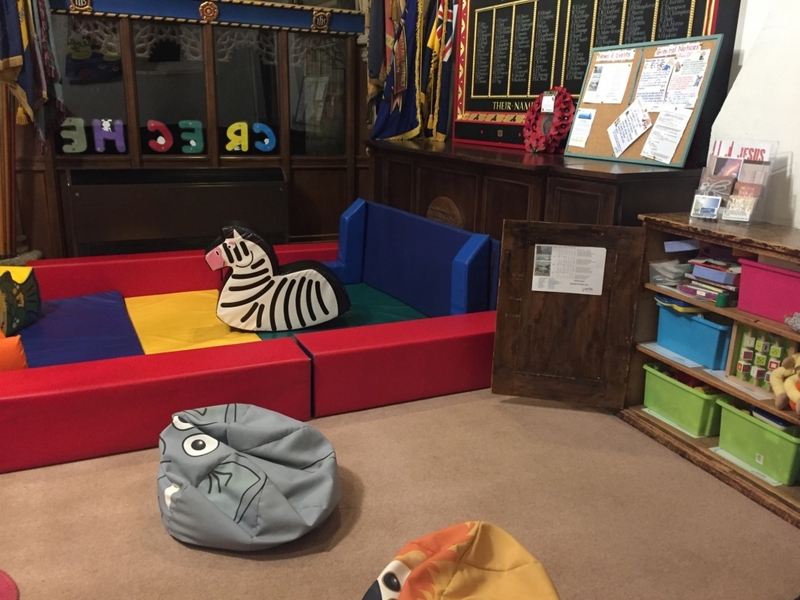 With a selection of soft-play and other toys with a Noah’s ark theme, it is always open during the 9:30am service. 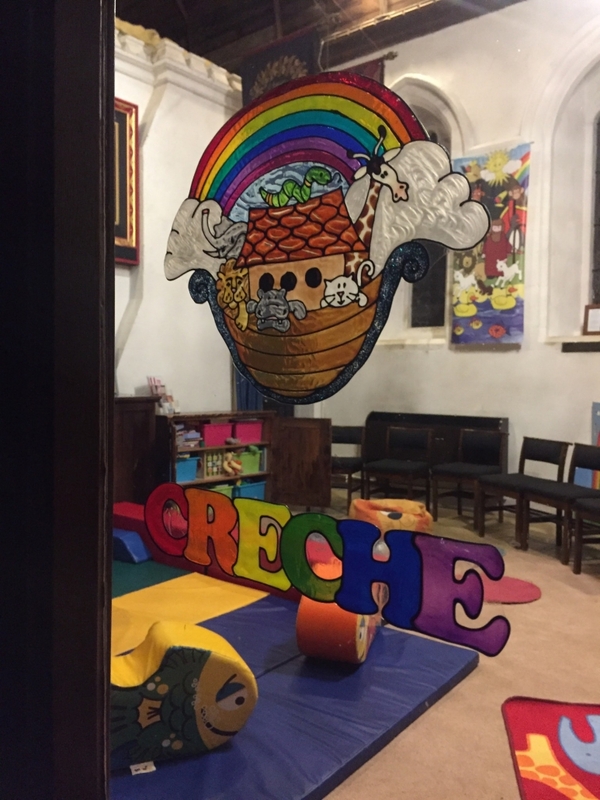 The crèche is normally staffed by two volunteers. Parents may leave their children in the capable hands of the volunteers and collect them at any time during the service. Alternatively parents may choose to stay with them in the crèche. 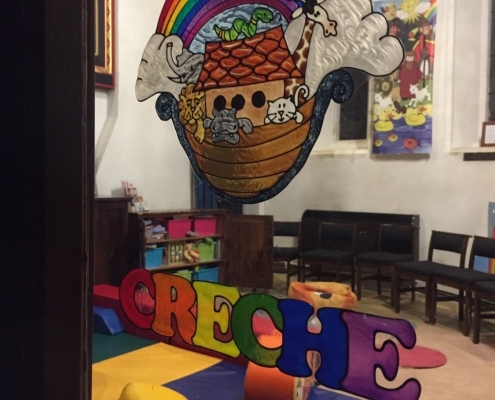 When the 9:30am service is designed for “All-Ages” (typically the first Sunday in the month and during school holidays) the crèche is open but “unmanned.” When unmanned, parents are very welcome to use the crèche but are asked to supervise their children. 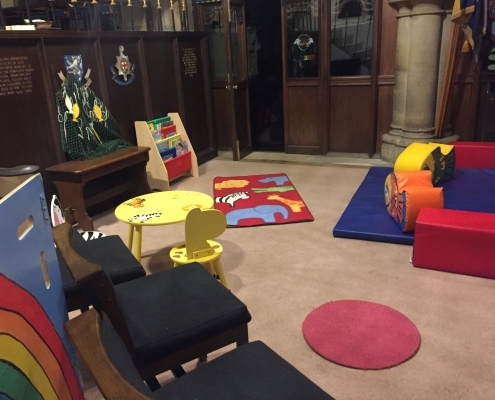 The Holy Trinity chapel has large windows into main church and sound system speakers to allow the service to be seen and heard from the crèche. All regular volunteers are DBS (previously CRB) checked. Please contact us as we would like to support your child in every church activity if we can. Liz Lobb (Lighthouse Coordinator), Fiona Prentice (Families & Children’s Worker) or the office. 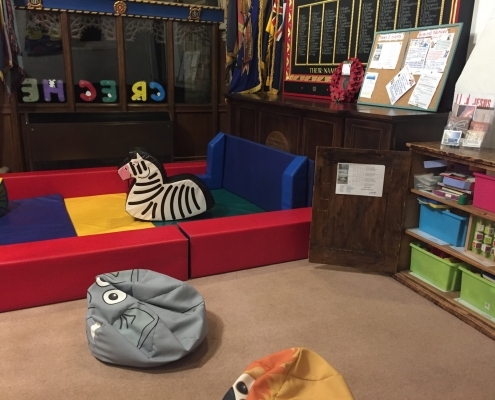 Help yourself to a fidget bag if your older child would benefit from some extra support during a service. They are kept in the creche cupboard. Please return at the end of the service so it is there for you next time. The church has a small kitchen with microwave, sink and kettle which can be used for warming bottles, snacks etc. It can be found in the modern extension to the church through the door in the far south-west corner of the church, up the stairs and it’s the door to your left. Two highchairs are available. They can normally be found in the Leslie Room or in the meeting room on the second floor of the modern extension. There are three toilets located in the far south-west corner of the church. Go through the far door into the modern extension, and the second door on the right has a toilet with baby changing facilities. There is a first aid kit located by the main entrance to the church. All are welcome at St Mary’s. For ease of access, ramps have been installed at the main entrance ie the North Door and in the north aisle. There is a disabled toilet located in the far south-west corner of the church (go through the far door into the modern extension and its the second door on the right) and a stair-lift allows access to the Leslie Room. The church has a “loop” system for the hard of hearing and large print news sheets are available (please ask the sidesperson for one).